Inside Info: What’s in the Bag? You probably already know that Second Harvest gets food out to 200 organizations and programs throughout the county, to the tune of over 8 million pounds per year, but do you know what kind of foods we distribute? Top Ramen and mac and cheese because it’s cheap? Nuts and chocolate for the calories? Canned goods for their long shelf life? There’s a range of factors, but three of the biggest are availability, geography, and health. 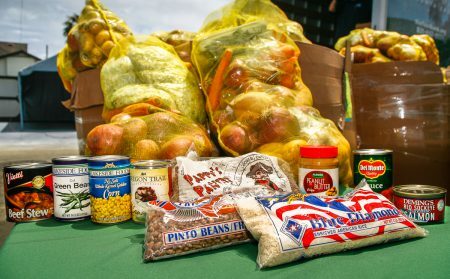 As a non-profit, we rely on direct donations of food for most of our supply, so when a supermarket has perishable food that’s nearing (but not at) the end of its shelf life, or perfectly good fruit that’s more “naturally shaped” than consumers prefer, or simply a surplus of a certain product—we accept it with open arms. We also receive dry foods from the USDA through a critical program called TEFAP (The Emergency Food Assistance Program), which supplies food banks like ours with everyday staples like rice, beans, peanut butter, etc. Plus, our community joins in, donating all sorts of (non-expired) dry foods during the annual Holiday Food Drive and Stamp Out Hunger. Our geographic location is key, as well—the Pajaro Valley is part of a $1.4 billion agricultural region. Our operations are close to fields of strawberries, artichokes, broccoli, and more, so we can accept foods from farmers and growers which would otherwise go to waste, and get them into our solar-powered coolers and out to our partners and programs before they go bad. Plus, when there are fruits or veggies we still need, we swap with other California food banks for items we have in surplus. Because we raise funds in addition to food, we can also buy items that are in high demand, usually protein and dairy like chicken, milk, and eggs. Whatever we buy, we often get for pennies on the dollar thanks to our large scale and our partnerships with outside organizations. So we don’t need to buy Top Ramen—we get great deals on real, nutritious foods. Which brings us to the third factor—health. We receive food of all kinds—sometimes it’s a truckload of mayo, and there’s a place for that too. But there’s more evidence than ever that highly processed, low-quality foods are depriving people of the nutrients they need, leading to rising rates of chronic diseases, and costing society billions. So we prioritize healthy foods and fresh produce, and our nutrition programs staff puts it directly into the hands of people in need, with tips and advice on how to make them a tasty and ongoing part of their lives. So what’s in the bag? Over 60% of the food we distribute is fresh produce; those USDA staples cover some of the other food groups (and with a longer shelf life); we supplement what we have with what people need most; and we encourage healthier options throughout. 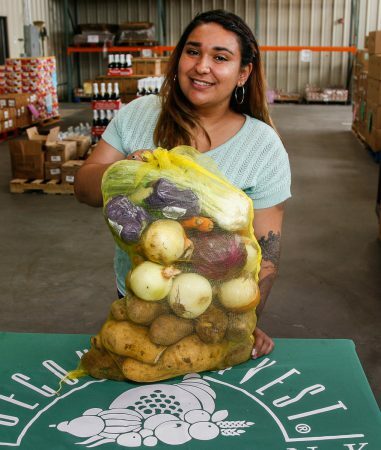 To feed 55,000 people per month, Second Harvest runs a lean operation, and we lean healthy, but we make a heavy impact on hunger in Santa Cruz County. See a neat pie chart of where our food comes from.